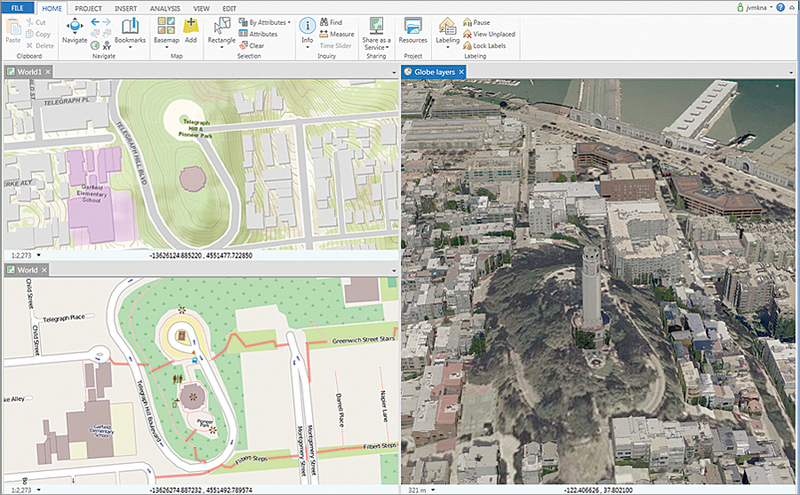 ArcGIS Pro is the desktop GIS you’ve been dreaming of, and now it’s here. This new application available with ArcGIS 10.3 for Desktop is just plain fun to drive. It taps into the full processing power in your desktop machine and lets you accelerate through geoprocessing and editing tasks. The multipane views in ArcGIS Pro let you compare changes and edit side by side in 2D and 3D. ArcGIS Pro also takes advantage of your visual cortex by providing a new and intuitive interface designed especially to help you see and interact with the whole geographic picture at once. Improved geoprocessing performance and options for creating automated analyses will help you crank out results faster than ever. No more drumming your fingers on the desk waiting for a process to finish. No more getting lost in contextual windows and dialog boxes, either. A new project workflow has been created that lets you organize your workspace, tools, and data right away and get busy getting your work done. You can work at speed and have fun while you’re doing it. ArcGIS Pro works side by side with ArcMap, so you don’t have to choose between them. You can also import your work from ArcMap into ArcGIS Pro. With your ArcGIS for Desktop license, you already have an ArcGIS Online account. ArcGIS Pro is connected to your ArcGIS Online account, so you can immediately pull in relevant content from ArcGIS Online to begin or augment a project. Because editing is easier and less complicated, you can get more work done in less time. Multipane views let you visually inspect and compare changes and edit side by side in 2D and 3D. Galleries and analytical tools displayed on the ribbon make it easier to quickly find the right tools for the job. Make great looking, impactful maps that display and share your work using cartography and design tools that have been added or improved. Sharing, collaborating, and showcasing your work can be done simply and effectively and that will help you shine. You can share layers, components, single maps, and even entire projects. You can create web maps and 3D web scenes that can be shared with others using just a web browser. When a new version is available, ArcGIS Pro will prompt you to update, eliminating worries about keeping track of installations and updates. ArcGIS Pro is available at no extra cost to all ArcGIS for Desktop customers who are current on maintenance. However, because it is a separate application from ArcMap, you need to download it separately onto each computer that you will use ArcGIS Pro on. ArcGIS Pro licenses are activated through an ArcGIS Online organizational account by an ArcGIS Online administrator for that account.